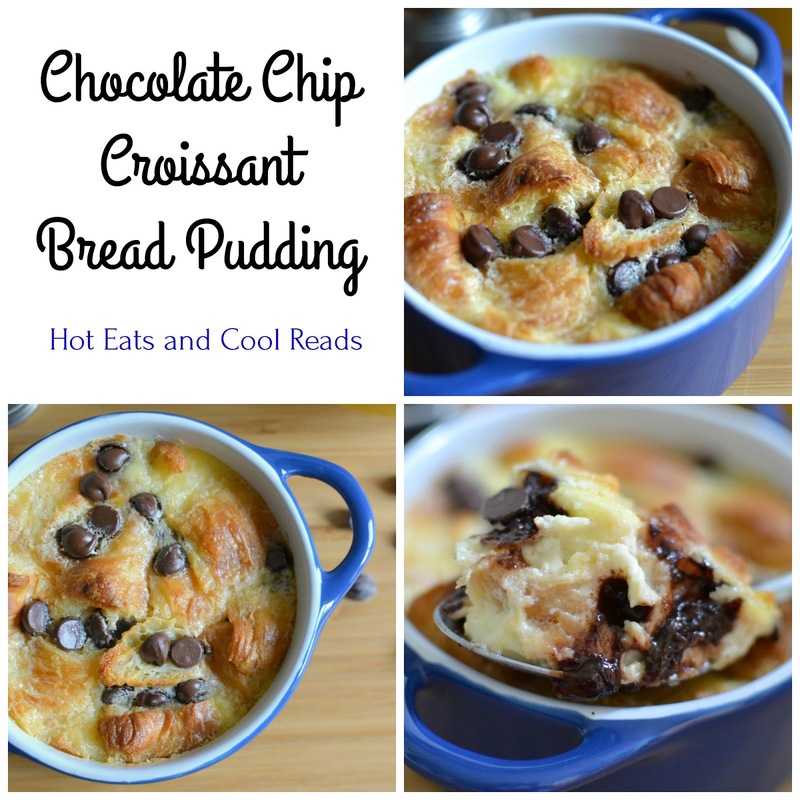 Rich, delicious and packed with bites of chocolate! 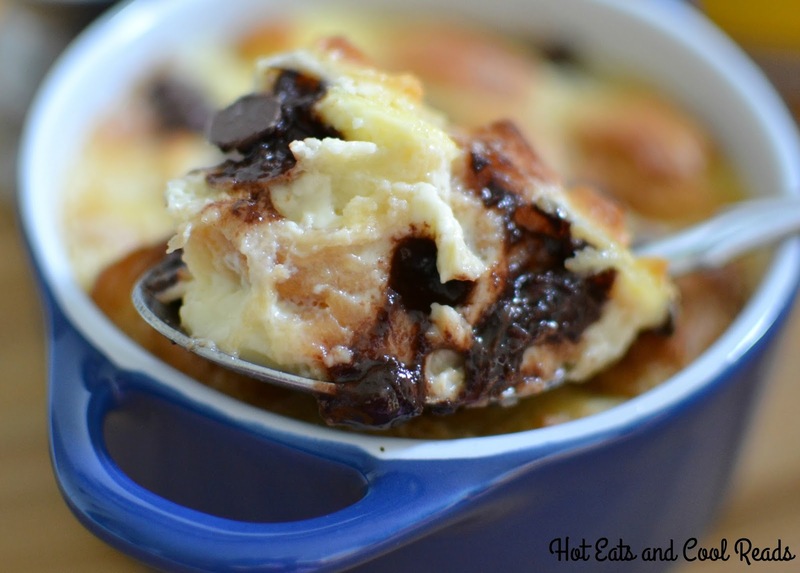 This decadent dessert is great for any occasion and the custard is to die for! It finally feels like fall today with cooler temps, but when I was baking this new recipe over the weekend, it felt like summer! We had 80's and 90's over the weekend here in MN and it was a bit warm for me! Cooler weather is perfect for turning on the oven and baking comfort foods whether sweet or savory. Sweet doesn't make an appearance here too often, but when it does, it has to be good enough for me to share! This one is defintely good enough. In fact, more than good enough. Plus, it's a great excuse to get together again with my blogging buddies for our recipe challenges. This month's theme? Desserts! YES! If you remember some of our past challenges, then you know they were pretty fantastic! We've done berries, pasta, chocolate, apples, no bake desserts, chicken, strawberries, and lemon! All of the recipes in these challenges are tasty and from some very talented people, so click over on each category and explore! What makes this bread pudding so unique? The croissants! Croissants are delicious by themselves or we love to make breakfast sandwiches with eggs, cheese and ham. But using them in a dessert like this is something special, extra special. 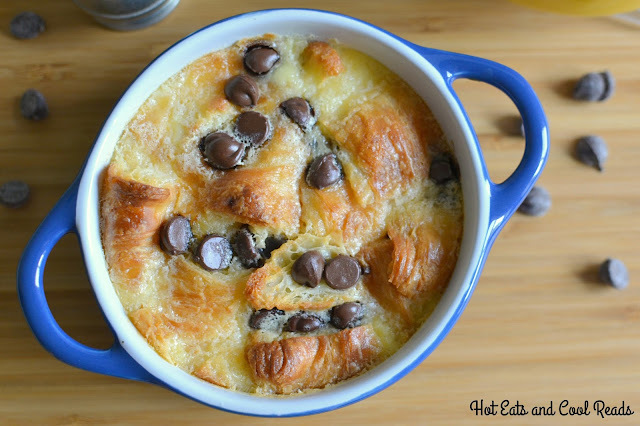 I LOVED every fattening, delicious bite of this heavenly bread pudding and I'm craving more. Don't judge, once you give it a try, you'll feel the same way, promise! It's not overly sweet, and has the perfect amount of chocolate chips! I also love that these are individual servings, making it fun and easy to serve! I used 2 cup baking dishes, but 1 cup size would be perfect for a smaller dessert. So fun for holidays, special occasions or dinner parties! 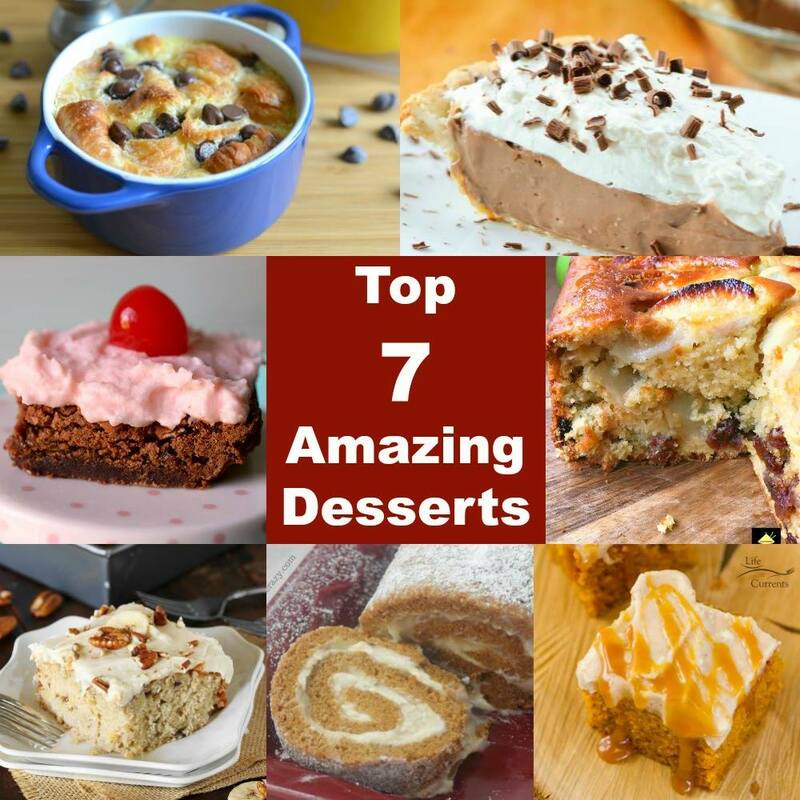 Check out all the other AMAZING Dessert recipes below from bloggers who took part in our Challenge! Cherry Amaretto Frosted Brownies by Who Needs a Cape? I hope you'll click over, check out all of these great recipes and say hi to my blogger buddies!! I love food, but I also love essential oils! Check out my Young Living page here for everything oils! Dice croissants and divide evenly between mini baking dishes. 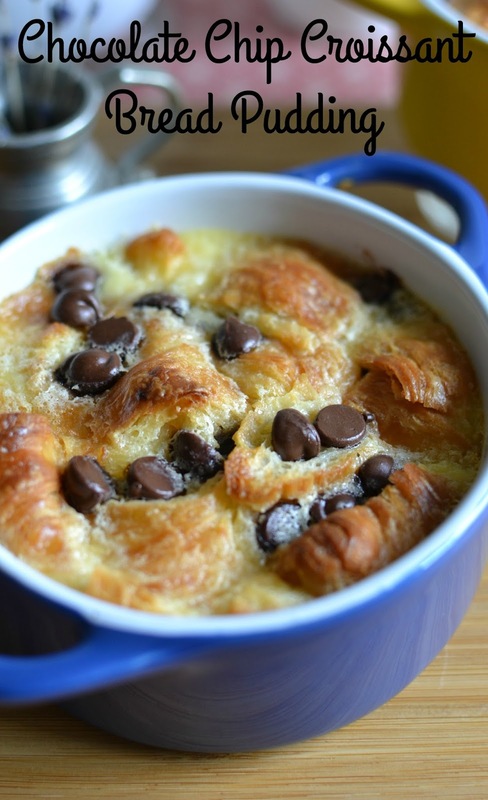 Scoop 2 tablespoons of chocolate chips into each dish on top of the croissants. In a mixing bowl, beat the eggs until light and frothy. Then add the sugar, beat for 3 minutes. Add vanilla, cream and milk, mix well. 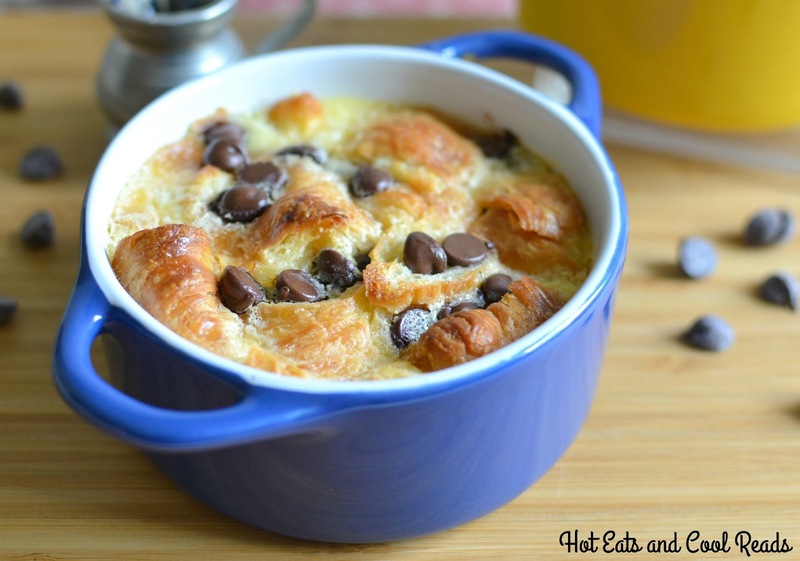 Evenly divide egg mixture between baking dishes and use a spoon to press croissants down into egg mixture. Place baking dishes into a 9x13 glass baking dish. Pour 1/2 inch hot water into 9x13 pan to make a water bath. Bake for 45 minutes, or until custard is set. Serve hot from oven, or cool and refrigerate serving later with powdered sugar sprinkled on top. These look fantastic! I love that they are individual. I will have to give these a try with gluten free bread! Wow this looks good. Moist and creamy. Luscious! I would love to make this to impress my family at Thanksgiving! This looks incredible! I love how easy it is too. I want to try this over the weekend. can't wait! This looks amazing! Huge yum! This is perfect for when I buy the Costco size package of croissants but only need a few...dessert the next day!!! yes!!! What a beautiful dessert. And fabulous photos! Bet it tastes even better than it looks.